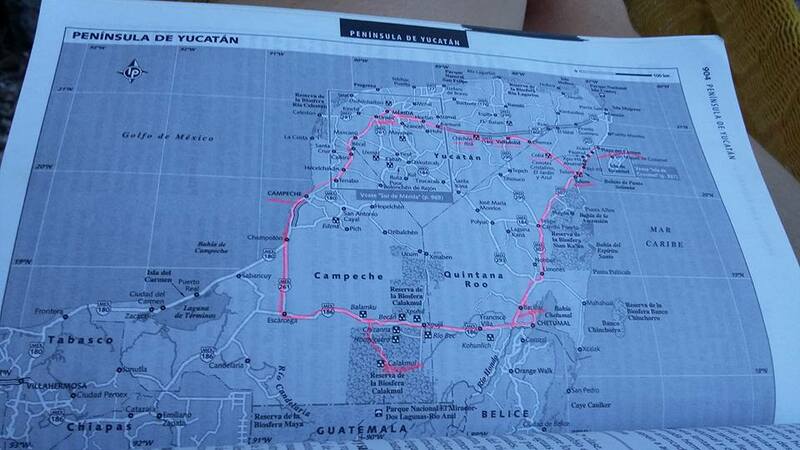 Yucatan in one week – Always Look Back ! I initially had a flight for Mexico DF but couldn’t go to this country without visiting the pyramids I’ve always been passionated about! 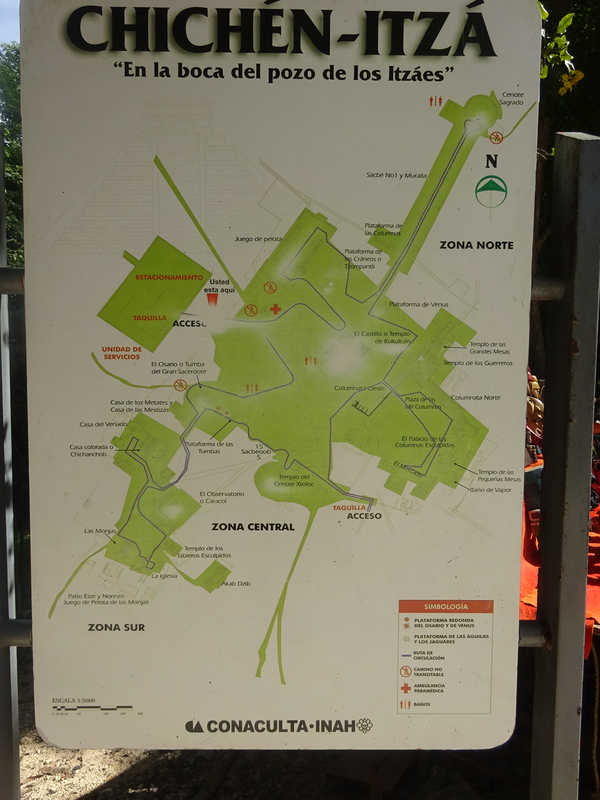 So I took a cheap flight to Merida, and had one week to discover some sites of Ruta Puuc, Chichen Itza, Coba, Tulum, before visiting the great Calakmul! I’ve also visited Valladolid and its cenote, and the nice city of Campeche. I arrived by night in Merida and took a taxi to my hostel (30min, 40 pesos). They had a tour to visit five of the Ruta Puuc sites, but as I hate to follow a group I prefered to go by myself. It was great to take my time, and to enjoy a local bus (where I discussed all along with a maya maid), but I only visited two of the sites: Uxmal and Kabah. Uxmal is the first maya city I’ve discovered in Yucatan, it takes at least 2 hours to visit it, and much more if you take a guide. It’s really gorgeous and impressive! Kabah is smaller but famous for some 300 masks dedicated to Chac, the rain god. It’s also very well preserved, you can cross the road to go to the west part, you will only distingish the ruins on the left of the way, and you will find a mysterious door which seems to be the start of an old autoroute of procession. The best way to visit this amazing region is to rent a car and enjoy the visit by yourself. – Hostel in Merida: Hostel Nomadas with their huge rooms, kitchen and swimming pool, 220 pesos (10e) per night! Chichen Itza is just a chef d’oeuvre! Its modern ans so special style can be related to the fact it has been built on an other maya pyramid like the one you can see in the region (with just one side to climb on). It has a total of 365 steps and draw twice a year (during the on equinoxes), a shadow in the shape of a snake, finishing by the snake heads on the bottom! You will also discover there the biggest ball court of the country, a huge “cenote”, an amazing observatory, or a huge palace full of columns! – Best period to visit is definitly during the equinoxe (19/21 march and 22/23 september) where they organize a special show! Valladolid is a really nice city where you will visit a spanish convent, various cenotes to swim in (I only visited the one in the center), a very small museum where you will find the oldest cross of the region (as they say…) and various cathedrals.It’s a nice example of a colonial city, in 2 hours you will see everything, doesn’t really worth to spend more. The Cenotes which look like nice natural swimming pools originally served as place for sacrifices… Think twice before diving in! 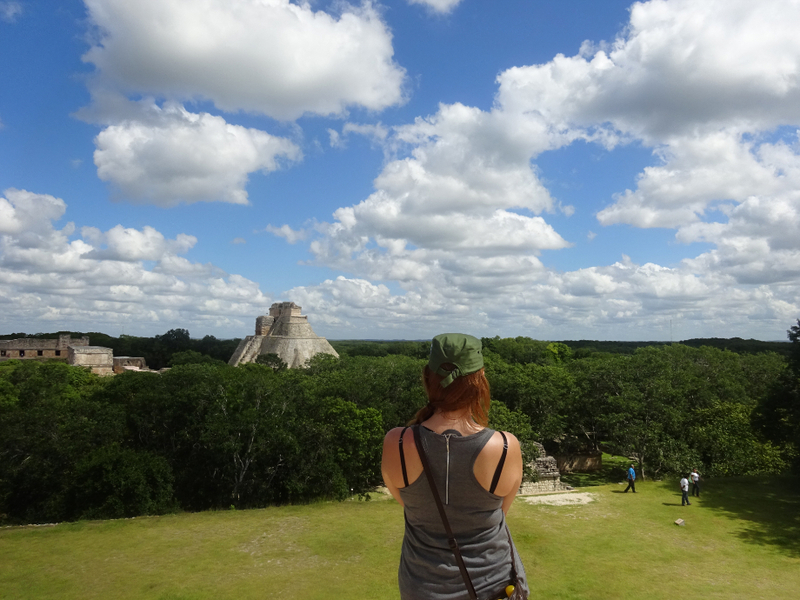 After one night in Valladolid, I went to Coba, one of my favourite ruins! It’s a juge city so you may need one of the bike driver avalaible in the entrance, or a bicycle to rent. I prefered to walked to fully enjoy this peacefull land! You finally can climb on the main old pyramid to enjoy an amazing view of the jungle. After maybe 3 hours of visit, I went to Playa del Carmen, and hated this place! You are in “Gringolandia”: a VERY touristic city, without soul… It’s nice for partying, though, because it’s full of bars and restaurants and has nice beaches! I paid 40 pesos the entrance, and 150 the bus to Bacalar. 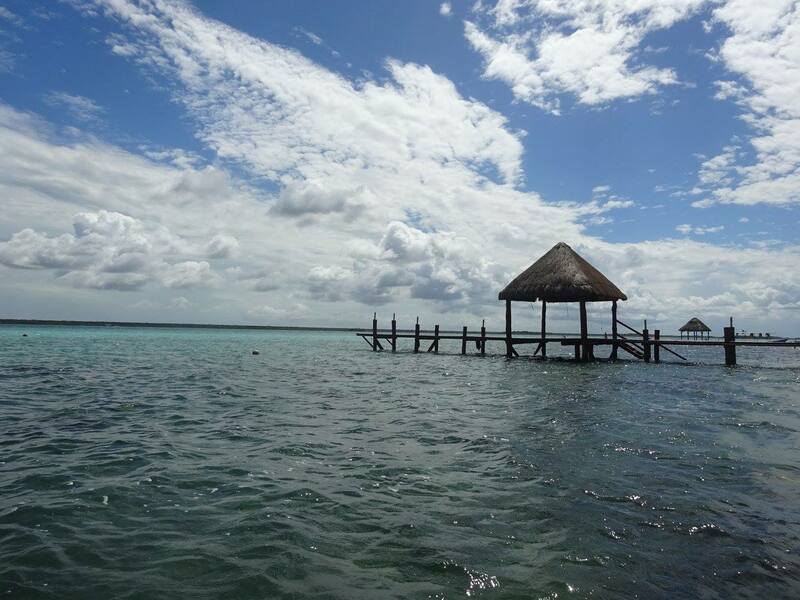 After a long trip from Tulum (3 hours), I arrived to this small city where there is not a lot to do but chilling! Bacalar has a old fort but that’s it, so I took a break in a very hippie hostel (Green Monkey), which was a paradise for young travelers! You can enjoy the nice blue lagoon, do standing paddle, kayak or jet ski but that’s it. I stood there one day and a half, and I met Mat to share the rent of a car from Chetumal to go to Calakmul. 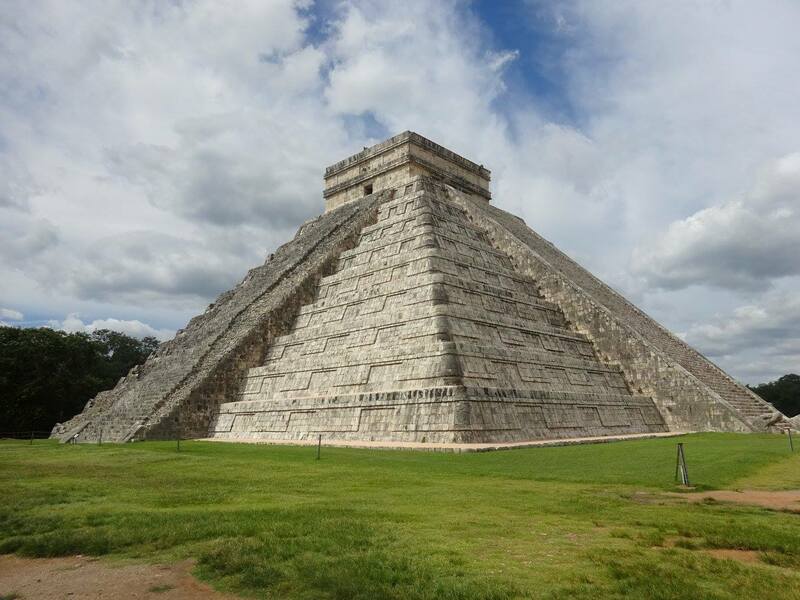 Calakmul is the sister of Tikal, a huge maya city with pyramids which look like mountains! 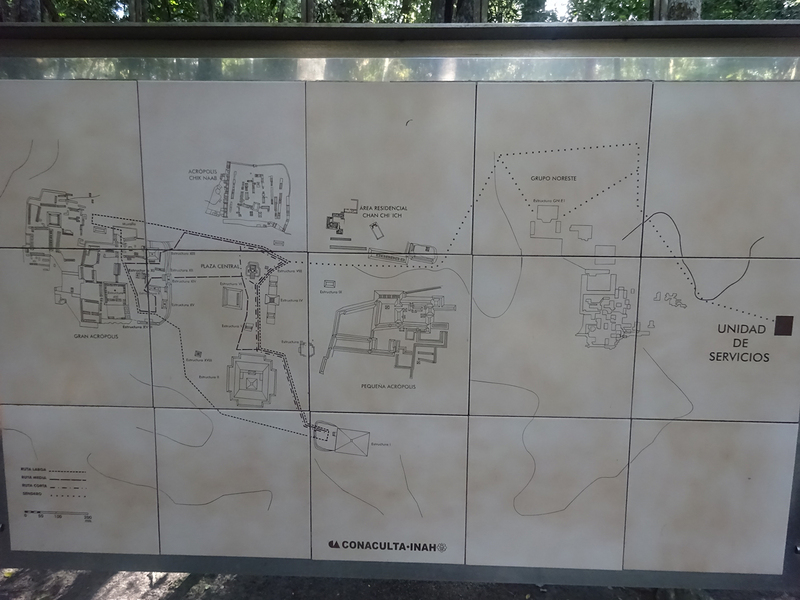 I’ve been impressed by Coba and Chichen Itza, but here is an other thing! All the hills you can see in the jungle are actually a potential pyramid. We arrived in the limit of the hour (accepted until 3pm), paid 70 pesos the entrance, and stood there until the sunset. You should go early to really appreciate all the site, we barely saw 25% of the ruins. From Chetumal we rented a car, and then you need 1h45 to get to the ruins (see the map of this site / Check the pictures on Facebook). We ended this trip together in Campeche where we left the car, and I took a bus to go back to Merida when I had a flight to DF. Leo & Yacine, two french brothers coming from Miami by bikes! Mat, a french traveller who shared a crazy visit in Calakmul!